For much of Jurgen Klopp’s reign at Liverpool, the focus has been the men up top. And while we cannot begrudge the effusive praise directed at Roberto Firmino, Mohamed Salah and Sadio Mane, a different position has increasingly come under the Anfield spotlight. This season, Liverpool have often struggled to execute the kind of free-flowing, effervescent attacking football with which Klopp has become synonymous. There have been problems in midfield. Naby Keita has taken time to settle while Xherdan Shaqiri has disappeared. In big games, particularly away in Europe, Klopp has deployed a rather static, uninspired trio of Georginio Wijnaldum, James Milner and Jordan Henderson. The logic is clear: that trio offers Liverpool’s defence the greatest protection. They bring balance, discipline and experience. What they do not bring, however, is gusto and forward momentum. Few teams would get away with it but, then again, few teams have Trent Alexander-Arnold and Andy Robertson at full-back. Their output throughout this season has been hugely impressive. Robertson’s exquisite cross for Firmino’s opener against Spurs on Sunday was his ninth assist in the league from open play. Only Eden Hazard – arguably the most gifted playmaker in the division – can match that. Alexander-Arnold has six, two of which have come from set-pieces, and it was his lofted pass into Salah which led to Toby Alderweireld’s own goal. The Reds may be cursing Manchester City by the end of the season but Pep Guardiola deserves credit for seemingly elevating the importance of a rampaging full-back. The Catalan convinced City to splurge £130million on Kyle Walker, Benjamin Mendy and Danilo in the summer of 2017. Indeed, Guardiola’s use of full-backs became a crucial feature of his title-winning machine. Of course, Klopp hasn’t needed to spend so lavishly in that position. Alexander-Arnold has been at the club since he was six while Robertson, who cost just £8million from Hull City in 2017, has a strong claim of being one of the shrewdest acquisitions in recent Premier League history. It is true that Liverpool have not been able to sufficiently fill the creative void left by Philippe Coutinho’s departure to Barcelona 15 months ago. However, while the Kop wait patiently for the best of Keita to emerge, Klopp’s two full-backs have often provided the craft and thrust so often lacking through the centre. 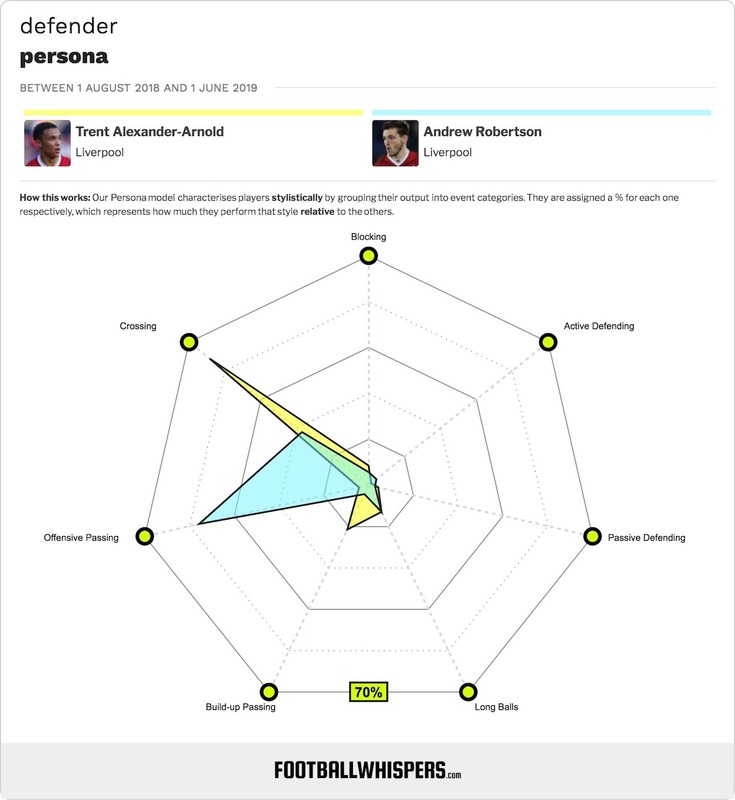 Alexander-Arnold, still only 20, is rapidly emerging as the David Beckham of his era. His range of passing is spectacular. From the flank, he can pick out teammates on a sixpence inside the box but he can also fizz passes into the feet of the front three in a manner which gives Liverpool a sense of penetration and urgency. Not only is he quick and mobile, but it’s rare to see a player so young with such a refined end product. TAA has completed 44 crosses this season – only two defenders can better that. Indeed, it was a measure of confidence that, on Sunday, he attempted to catch Lloris off guard by attempting to score from a corner. Robertson is every bit as impressive. Astute in his defensive duties, the Scotland captain is an exceptionally effective outlet down the left. The 25-year-old has won possession in the attacking third 15 times, ranking him second among defenders, while he has assisted the most shots in open play. His total expected goals assisted of 5.14 this season is enough to rank him second. But the midfielders are the unsung heroes in all of this. 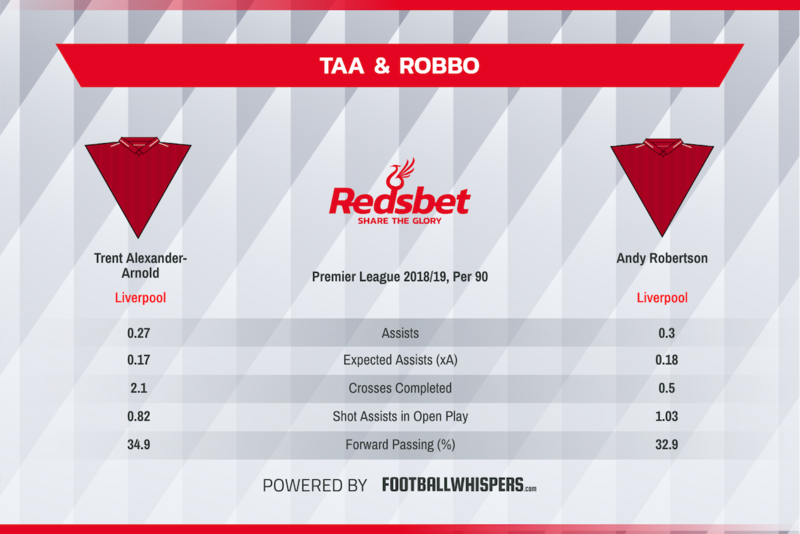 The likes of Milner and Fabinho, both of whom have experience playing at full-back, have the positional sense to tuck in and cover Alexander-Arnold or Robertson, ensuring that, should they get caught high up the pitch, the Reds back-line remains protected. Klopp had two very attack-minded full-backs in Nathaniel Clyne and Alberto Moreno when he was appointed Liverpool boss. But whereas Clyne succumbed to injury problems and Moreno proved too error-strewn to maintain a spot in the side, TAA and Robbo have cemented their place at the heart of the club’s future.